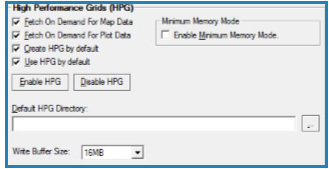 S3GRAF-HPG (High Performance Grids) is the ground-breaking and innovative add-on module for S3GRAF, the leading reservoir simulation post-processing tool. It enables engineers to start work on GBytes of multi-million active cell grids and associated restart data in seconds eliminating the data loading bottleneck. S3GRAF-HPG supports the widest range of simulators in the market including Eclipse, CMG, VIP, Nexus, UTCHEM and many more. It is easy-to-use and flexible, enabling reservoir engineers to enhance their productivity and make key decisions fast. S3GRAF-HPG embraces fetch on demand and intelligently applies it to the needs of reservoir engineers. It enables an enormous improvement in data loading, up to 100x faster than conventional methods, meaning that engineers can get to work immediately on their data. S3GRAF-HPG also incorporates a minimum memory mode, which greatly reduces computer memory overhead. This means that only the data the engineer is displaying and working with actually resides in memory. When one vector is replaced by another (e.g replacing pressure with oil saturation on a grid view), any data no longer in use is removed from memory. In this way S3GRAF-HPG adds a significant contribution to the overall smooth performance of a user’s computer.